It is difficult to believe spring is just a week away. If it weren’t for the disappearing snow, spring would be one of my favorite Adirondack seasons. Muddy conditions aside, springtime in the Adirondacks is abundantly beautiful and alive. As the snow melts, the faded grays and greens of the landscape morph into verdant, vibrant chartreuse and shimmering emerald vegetation. The sun is warmer and shines longer, Adirondack wildflower season begins, water is moving fast as rivers, streams, lakes, and ponds loosen up, and the roads are ready for cycling. The pace picks up, and outside at the homestead, the birds are noisily establishing their territory. Symbolically, spring is indeed my favorite season. This is the time of planting seeds and new beginnings, a great time anywhere, but exhilarating in the Adirondacks. On that note, I’d like to formally introduce something new here at Adirondack Lifestyle. Thanks to my favorite rocket scientist and son, Eddie, I have a new real estate website. Please stop by and check it out, especially if you are interested in buying or selling a property or business in the Adirondacks. As for the status of Adirondack regional real estate market, maybe it is the spring energy, but transactions and buyer interest continue to grow. My real estate colleagues and I are busily working through the larger than normal inventory and buying has therefore become more competitive. The pace is picking up – sounds like springtime in the Adirondacks! Drop me an email if you’d like to get in on the Adirondack real estate springtime energy. 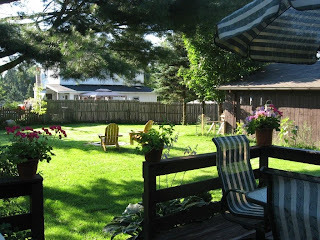 Today's featured photo is the lush backyard of a home I have for sale within walking distance to the Village of Lake Placid, but has no Village tax burden. A great value, the owners of this home have a growing family and business and need a larger property. Click here for more details.